Personalised Price Tags, Design Your Own Price Tag, Made in the UK. Create custom folded price tags for your products, printed with your logo, design, photos, both inside and out. Available in multi-packs of small, medium or large tags. Add the perfect finishing touch for your new collection and create your own brand tags with ribbon or metal chain. Easily add text and experiment with your logo on tags in our online design studio. Get creative and let your products shine even more with custom folded price tags. 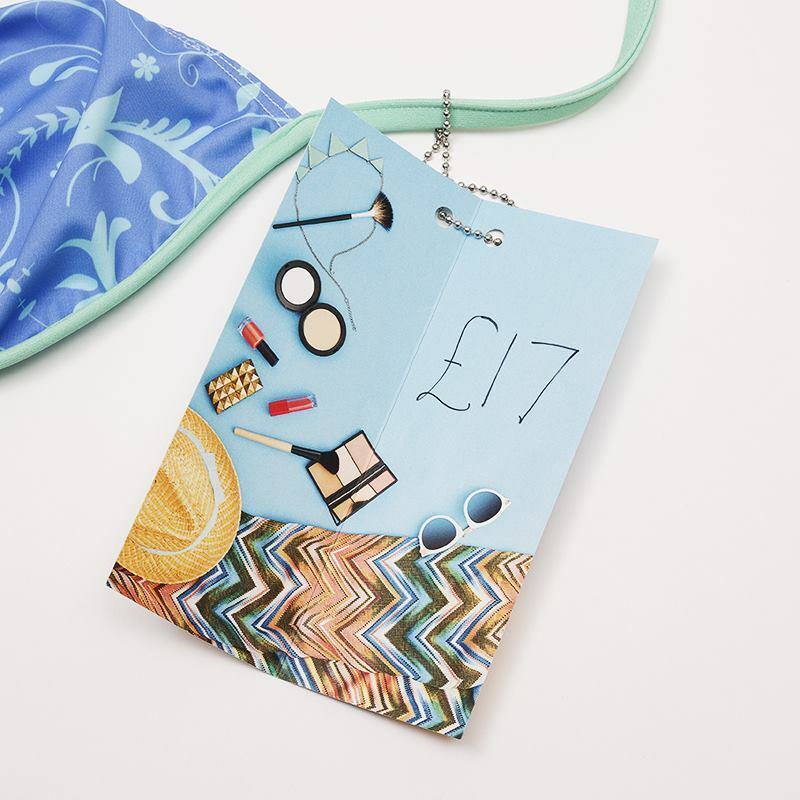 Whether you’re a designer or maker of garments, accessories, crafts or beauty and skincare products, personalised price tags are guaranteed to help your items stand out from the crowd. Design your own price tags with a different print on both the outside and inside to grab customers attention and share vital product information, such as prices, materials and care instructions. Choose from packs of small (9 pack), medium (6 pack) or large (6 pack) price tags to give your work the presentation it deserves. The 300 gsm thick recycled card means your tags are sturdy and long-lasting and printed in full-colour inks. You can even add text or photo montage options by experimenting with our online design studio. Care: Avoid contact with water or moisture, and simply wipe clean with a dry cloth. What Will My Price Tags Look Like? You can select the same or different designs for the outside and inside of the folded cards and can add extra layers of text over your designs if necessary, for extra customer information. The cards are available in three sizes, with different multipack sizes available depending on the dimensions. Choose from a pack of nine small cards (55 x 85 mm each), a pack of six medium cards, or a pack of six large cards. For that extra professional touch, choose from three finish options. A silver ball chain, slim red ribbon, or left simply with a punched hole for your own finish. Who Will Love These Price Tags? These price tags are perfect for any designer, maker or retailer who wants to add a special finishing touch to their products, or simply for adding a unique, customised element to an exciting event. These professionally created price tags not only complete your pieces but can help tie together your branding by incorporating your logo and colour scheme. These could make a great gift for any budding artists or fashion designers in your life, and encourage them to take the leap and start their own brand! Your new personalised price tags are created using FSC approved recycled white card, which has a sleek matte finish. The card is 300 gsm thick so is sturdy and durable and the white backing colour displays your print beautifully. Using a professional printing process, a long-lasting print is created using environmentally friendly inks – all onsite in our London based factory. Create a bold design which will grab customers attention and draw them into your product. As well as being beautiful price tags for your products, you could also create unique wedding favour place cards for table settings. Create a lovely memento which your guests will remember with years to come, thanking them for sharing your special day with you. When designing your cards online, make sure not to put any important elements in the hole punch area. Check your designs by clicking ‘product view’ in the design studio. Check out our swing tags that have a twist, made from 100% real leather. Custom printed swing tags and swing tickets for independent makers. Design the same or different.